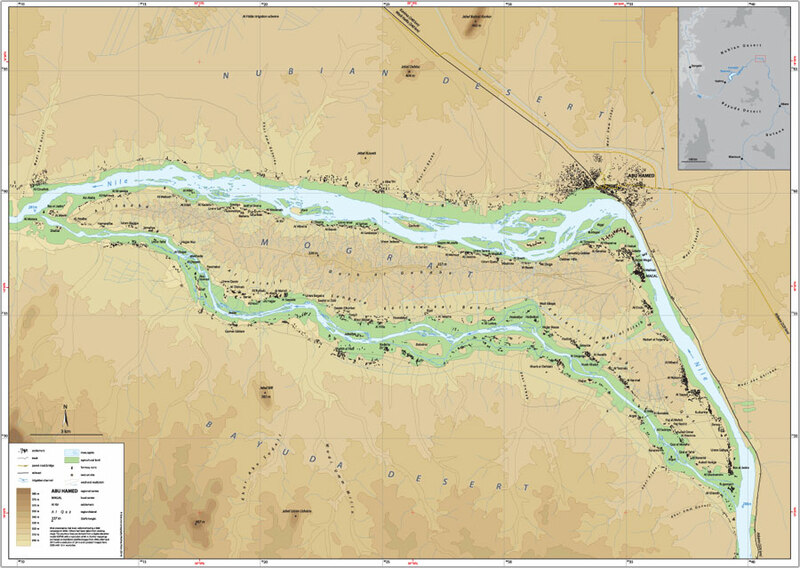 Mograt is the largest island in the Nile, situated in northern Sudan at the upper end of the great river bend between the 4th and 5th cataracts. It is therefore located at a point where important long-distance communication and traffic routes meet. Mograt’s significance is reflected in the island’s rich past through all periods of Sudan’s history up to the present. Several fortresses lie in prominent positions along the river banks. Ancient cemeteries are situated on the island’s inner plateaus, but also closer to the fertile land by the Nile. Stone Age sites – some of them possibly more than one hundred thousand years old – dot the interior of the island. Today, Mograt is a bustling place with more than 10,000 inhabitants. People belong to the Rubatab, the main ethnic group on the island, the Ababda, Manasir and others. Seasonal migrant workers join the island’s community during the date harvest and for other job opportunities. The river banks of the island are farmed with date palms and more recently with newly introduced fruit trees, which grow in abundance. The main seasonal crops are wheat and sorghum as well as diverse vegetables, spices and animal fodder. Mograt belongs to the administration of the Abu Hamed Locality. The island has 14 schools. Its first primary school was established in Sinjarab in 1918, making it the first school along the whole stretch of the Nile between Berber and Karima. While Sinjarab formed the cultural and educational center of Mograt, Maqall was once the most important market in the whole region. Today many shops and the administrative unit are located in the booming town of Abu Hamed on the northern mainland bank of the Nile. A ferry connects Mograt to the mainland near Abu Hamed, and there is also a floating bridge on the island’s southern bank. Apart from farming activities and animal husbandry, many of the people from Mograt work in the booming gold mining sector and its related economies in and around the town of Abu Hamed. View a larger version of the map of Mograt Island here.